Allstate Insurance recently conducted an interesting survey of American drivers and what they thought about their ability as drivers and those drivers around them. Survey says, we are a little conceited when it comes to our driving! American drivers in general believe their own driving habits, ability and driver safety behaviors are far better than the drivers around them they share the road with. Of the drivers which were surveyed, 64% rated themselves as excellent or very good drivers. But when they were asked to rate their friends or people their own age, the 64% was twice as high as the rating they would give these people. 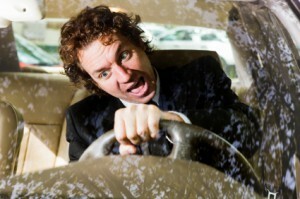 Surprises, 56% of the surveyed drivers have been involved in an accident…56%! Of that group, only 28% believed they were at fault. Just goes to show you, we all really think we are great drivers, but when it comes down to it… most of us have been involved in accidents, and of course, not my fault. Really not that surprising in this day and age of individual responsibility. The bottom line is, regardless of how good of a driver you think you are, the guy next to you yabbering away on his cell phone with one hand on the wheel thinks he is better. Take an online driver safety course from DefensiveDriving.com, we’ll teach you techniques you have forgotten to avoid the professional driver next to you as he comes into your lane answering that all important text saying … “HEY” from his buddy. Drive safe and remember, Got a Ticket? Just Click It! with DefensiveDriving.com – take our defensive driving course to really be better than they think they are!